We took an early-morning flight to Lima where we saw a flock of 100+ Pacific Doves by the airport. We were to see many more. Driving down the coast we noted that all the lampposts held Neotropic Cormorants with patches of guano underneath! The sea was rough and Peruvian Boobies were seen soaring over the waves while Band-tailed and Kelp Gulls flew along the shoreline. Our first stop was a sandy area not far from the coast. 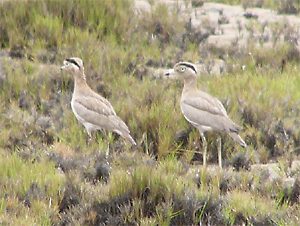 It took only a minute or two for us to find two Peruvian Thick-knees standing quietly in the scrub-covered land. Then it was on to a site Frank had heard of but had not been too. We drove along the dry arid edge of the Atacama Desert until we found what looked like a dried lake with quite a lot of scrubby bushes. The ground was extraordinary in that it was cracked, as one would expect a dry lake bed to be, but the cracks were half a metre deep and often covered in vegetation. This made for interesting walking! Despite the challenges of the surface, we had some great birds here: Short-tailed Field-tyrant, Croaking Ground-dove and bright-orange Vermillion Flycatchers. We were seeking hummers here to and soon had both Amazilia Hummingbird and the hoped-for endemic Peruvian Sheartail. Next, we made a stop by the shore when someone called cetaceans. There were 20+ Inshore Bottle-nosed Dolphins not far offshore and lots of birds on the beach: 100+ Grey Gulls, Kelp Gulls, Blackish Oystercatcher and Hudsonian Whimbrel. Out at sea were Peruvian Boobies, Inca Terns and a lone Red-legged Cormorant. We stopped for lunch at a seafood restaurant overlooking some rocky mudflats, which was literally teeming with migrant waders. Wilson's Phalaropes, hundreds of Least Sandpipers, Semipalmated Sandpipers, Spotted Sandpipers, Hudsonian Whimbrels, Ruddy Turnstones, Black-bellied Plovers, a few Surfbirds, a few Red Knot, even rarities, a Curlew Sandpiper and a Sanderling (second record for Peru!). There were also many Grey-headed, Band-tailed and Kelp Gulls and offshore were 1000+ Peruvian Boobies diving into the sea. We then drove on to our hotel, dropped our luggage off and were soon out again driving through the edge of the Atacama desert to the coast. En route, on the edge of town, we picked up three Coastal Miners. As we arrived at the cliff edge, Inca Terns sat on rocks beneath us and flew virtually around on heads. No sign of our target bird so we moved on a couple of few kilometres where after a short walk, we were soon watching the endemic Peruvian Seaside Cincloides (sometimes called Surf Cincloides). Continuing our walk along the cliff top, we saw more Grey, Band-tailed and Kelp Gulls, and found, on a wave-splashed rock, two more Peruvian Seaside Cincloides showing exceptionally well but being harassed by a Blackish Oystercatcher who did not like them being on his rock! After our morning trip to the Ballestas Islands and beyond we now had the long drive back to Lima. We again stopped at the fish restaurant and saw many hundreds of birds while we lunched. 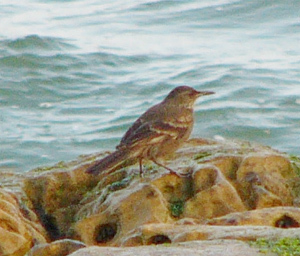 New birds were Peruvian Tern, Western and Baird's Sandpipers. Out to sea was a flock of 10,000+ Peruvian Boobies stretching across half the horizon! En-route, we stopped several times adding out first dark-headed gull, a Laughing Gull on one and 25 Peruvian Thick-knees in a loose flock on another. Our final Peruvian birding was at a marsh by the roadside. A beautiful Peruvian Meadowlark sang from a fence post, White-cheeked Pintails were on the water and a Killdeer fed on the margins along with birds we had seen before.